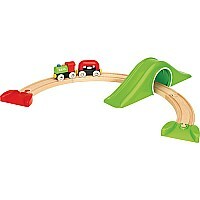 This playful wooden train, with its tunnel and clever turn-able magnets which always connect in every direction offers more to explore than just the tracks ahead. Educational toy that inspires logical thinking. Perfect for the inquisitive toddler.